The Pittsburgh Symphony Orchestra and the Mendelssohn Choir of Pittsburgh take the stage at Heinz Hall in Pittsburgh for Tree of Life: A Concert for Peace and Unity, which airs Tuesday, December 11 at 8pm on PBS stations nationwide. Credit: Edward DeArmitt. PITTSBURGH, PA and ARLINGTON, VA -- PBS will broadcast nationally WQED’s locally-produced Tree of Life: A Concert for Peace and Unity, a free community event, presented and hosted by the Pittsburgh Symphony Orchestra to honor the Tree of Life Synagogue victims and first responders. The performance, featuring Itzhak Perlman at Pittsburgh’s Heinz Hall, was taped on November 27, one month after the tragedy, as part of the PSO’s “Music for the Spirit” series. Made possible with support from the Corporation for Public Broadcasting (CPB), Tree of Life: A Concert for Peace and Unity, a one-hour special, will air nationwide on PBS stations on Tuesday, December 11 at 8:00 p.m. (*check local listings) Watch a clip. Tree of Life: A Concert for Peace and Unity will stream on PBS.org and on the PBS Facebook page concurrently with the broadcast. The concert will also be available for streaming after broadcast on station-branded PBS platforms, including PBS.org and PBS apps for iOS, Android, Roku, Apple TV, Amazon Fire TV and Chromecast. Renowned Israeli-American violinist Itzhak Perlman joins Music Director Manfred Honeck, the Pittsburgh Symphony Orchestra, PSO Principal Clarinetist Michael Rusinek and the Mendelssohn Choir of Pittsburgh. All artists graciously donated their services for this performance. “As advocates of peace, tolerance and understanding, the Pittsburgh Symphony Orchestra brings people together through the universal power of music to collectively grieve and heal after this horrific tragedy, both locally and across the country” added PSO Music Director Manfred Honeck. WQED creates and shares public media that educates, entertains and inspires. It is the parent company of WQED-TV (PBS); WQED World; WQED Create; WQED Showcase; WQED PBS KIDS Channel; Classical WQED-FM 89.3/Pittsburgh; Classical WQEJ-FM 89.7/Johnstown; the Pittsburgh Concert Channel at WQED-HD2 (89.3-2FM) and online at www.wqed.org/fm; local and national television and radio productions; WQED Interactive (www.wqed.org) and WQED Education (www.wqed.org/edu). 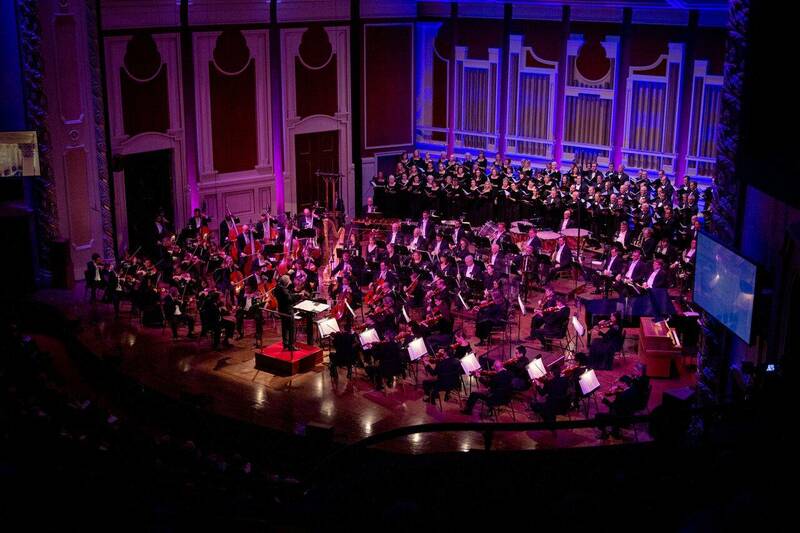 The two-time 2018 Grammy Award-winning Pittsburgh Symphony Orchestra (PSO) is credited with a rich history of engaging the world’s finest conductors and musicians, and demonstrates a genuine commitment to the Pittsburgh region and its citizens. Known for its artistic excellence for more than 120 years, past music directors have included Fritz Reiner (1938-1948), William Steinberg (1952-1976), Andre Previn (1976-1984), Lorin Maazel (1984-1996) and Mariss Jansons (1997-2004). This tradition of outstanding international music directors was furthered in fall 2008, when Austrian conductor Manfred Honeck became music director of the Pittsburgh Symphony Orchestra. The PSO is continually at the forefront of championing new American works. They premiered Leonard Bernstein’s Symphony No. 1 “Jeremiah” in 1944 and John Adams’ Short Ride in a Fast Machine in 1986, and in the 2018-2019 season they premiered Mason Bates’ commission for Honeck’s 60th birthday celebration. The orchestra has a long and illustrious history in the areas of recordings and live radio broadcasts. Its recording of Shostakovich Symphony No. 5 / Barber Adagio for Srings won 2018 Grammy Awards for Best Orchestral Performance and Best Engineered Classical Album, and their “Pittsburgh Live!” series with Reference Recordings resulted in back-to-back Grammy nominations in 2015 and 2016. As early as 1936, the PSO has been broadcasted on the radio. Since 1982, the orchestra has received increased attention through national network radio broadcasts on Public Radio International, produced by Classical WQEDFM 89.3, made possible by the musicians of the Pittsburgh Symphony Orchestra.